Friday was another one of those Alice in Wonderland days where all you can do is shake your head in disbelief at the absurd lengths to which desperate European politicians are going. Grinning financial experts on TV on Friday were declaring that German Chancellor Angela Merkel had agreed to back down and accept the terms of French President Nicolas Sarkozy, and that a bailout of Greece had been agreed on. Actually, nothing had been agreed on except for the use of the word "voluntary" in a way that was completely meaningless. But it will allow Merkel and Sarkozy to go back to their respective countries and make contradicting claims. Greece's total debt is an astonishing 350 billion euros. The Germans are sick of paying to bail out Greece, so they're demanding that Greece "reprofile" or "restructure" its debt, so that Greece will owe less than 350 billion euros, and the investors can absorb the loss. This would be a form of default. The investors are the banks, with the European Central Bank (ECB) being the biggest bondholder, so the ECB is dead set against default by any name. The French are on the side of the ECB. There's an even bigger problem with any kind of default. Recall that a credit default swap (CDS) is an insurance policy that insures against the default of a bond. Any kind of Greek default would trigger a "credit event" or "rating event," that would would require all CDS insurance policies on Greek bonds to be paid off. It is believed that this would require hundreds of billions of dollars in CDS payments, causing a chain reaction of bankruptcies. Therefore, on the one hand Greece MUST default, but on the other hand, a default would be catastrophic -- according to whom you believe. 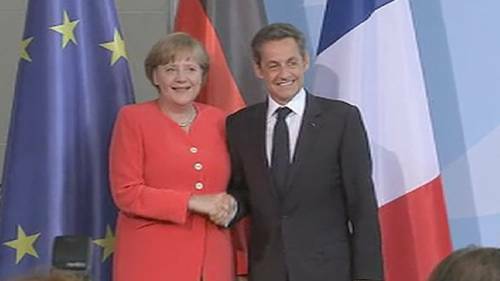 So Merkel and Sarkozy agreed to an Alice in Wonderland compromise that's been in the works for a few weeks. The compromise is that investors will contribute "voluntarily." Suppose you have a 2-year Greek Treasury bond that's due to be redeemed in January. Then in January, instead of redeeming it, you will voluntarily roll it over, and take a 10-year bond in exchange. And so, as we recently quoted from Euro Intelligence, nobody in their right mind would voluntarily take up any exchange offer of this type, and to the extent they do, the rating agencies, and everybody else will conclude that they have been forced. And if there's any sort of force or coercion, then a credit event will be triggered. So what did Merkel agree to? "The main principle is a voluntary participation from the banks. That’s an important message for the banks because there are worries that we’re starting a credit crisis and we don’t want to take that risk." Sarkozy, on the other hand, seems to be satisfied that French banks will accept only small losses, if any. So both sides got what they wanted, even though they wanted opposite things. It's a miracle! In fact, there was no agreement on anything, since the terms of the bailout were left for another day. There was no attempt to define what "voluntary" meant, for example, or how you get investors to "voluntarily" screw themselves with no coercion. "We want to act as soon as possible, without fixing a date, but September wouldn’t be 'as fast as possible' and we’ll have other concerns in August, and as we’re already half way through June, so 'as soon as possible' probably means July." So there you have it. There was absolutely no agreement on Friday, but they put out a silly, meaningless statement about "voluntary" restructuring, and said they'd try to work out the details next month, but they're not sure of the date. The Eurogroup finance ministers are going to meet in Luxembourg on Sunday. They are expected to approve the next tranche of last year's bailout, even though Greece's economy has gotten worse in the last year, and has not met the conditions for receipt of this money. But the alternative is immediate bankruptcy by Greece, with all the consequences described above, and so Greece will just get the money, probably with no conditions attached. This will permit Greece to pay its bills through September, and that will give the Europeans time to figure out the details of the "voluntary restructuring." As we described a couple of days ago, Greece's government was in total chaos and close to collapse, partially because of some missteps by Prime Minister George Papandreou in response to the massive street riots earlier this week. Several of Papandreou's ministers resigned, and on Friday, Papandreou appointed a new finance minister, according to Kathimerini. The purpose of the cabinet reshuffle was to quell dissent from people in Papandreou's own Socialist party. Whether that's enough may be revealed on Tuesday, when Papandreou will face a vote of no confidence in the Parliament. It will effectively be a vote on Panadreou's entire austerity program, which was a condition of the bailout. If Papandreou loses the vote of confidence, it will almost certainly also mean that his entire fiscal austerity program will lose as well, and that could cause Germany to pull out of the bailout package altogether. Another thing that can go wrong is that Germany's Federal Constitutional Court in Karlsruhe, which will be meeting on July 5 according to Bloomberg, could declare the aid package unconstitutional, and block it. One thing that was apparent from the commentary on Friday was that there's almost no one left who believes that Greece is going to escape default eventually. In the case of the war in Libya, you can always hope that someone will kill Gaddafi, and everyone will live happily ever after. But no one believes that the situation with Greece is going to end happily. Between the riots, the no-confidence vote, the court hearing, the Eurogroup meetings, and the investors, this situation could turn into a major world crisis on any day.